Hermann Hesse, author of books such as Siddhartha and winner of the 1946 Nobel Prize in Literature, is the perfect writer for teenagers. His novels are painfully earnest, full of sensitive characters who are struggling against the soul-destroying conventions of society and searching for transcendence. This description certainly fits Harry Haller, the central character in Hesse’ most famous book, Steppenwolf. And it’s not hard to see why Harry would appeal to adolescent readers (despite the fact he’s nearly 50 years old). Harry is grumpy, gloomy, brilliant, artistic, misunderstood, rejected, spends a lot of time alone in his room brooding, and is – turns out – pretty horny. This exactly describes the kind of teenager who would bother picking up Steppenwolf in the first place. The question is, for those of us who read Steppenwolf twenty or thirty years ago, Should we bother reading it again? Steppenwolf is still utterly humorless and Harry is still gloomy, misunderstood, brooding. What stands out now is how dull Harry Haller is. Hesse keeps telling us how fine a soul Harry has: how intelligent is he, how artistically refined, and how much he suffers. But the only evidence we have of Harry’s genius is Hesse’ say-so. Nothing in Steppenwolf persuades us that Harry is as remarkable as Hesse claims, and without any tangible signs of brilliance, Harry is rather uninteresting, except for when he’s being petulant. Steppenwolf also displays that vanity particular to the aging male animal, which is the magical belief that beautiful young women find us attractive. In the real world, young women don’t fall for decaying misanthropes unless they have a sum of money and Harry doesn’t. But Hesse asserts that not one, but two gorgeous young girls are fascinated by Harry and that he is still capable of prodigious feats of physical love with them. 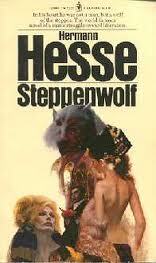 What saves Steppenwolf is how thoroughly Hesse destroys any sense of value we might have for Harry’s genius. Hesse still sees Harry as a unique soul – but a unique soul leading a useless existence. Harry is a man who has forgotten how to laugh or find pleasure in life. He’s a fool who should be pitied, and scolded, and taken by the hand and pulled away from his stubborn loneliness and self-importance. When this happens, Harry does become interesting. He begins to feel human. He engages our sympathy. And he makes the long hallucinatory sequence that forms the middle-end of Steppenwolf credible rather than ridiculous because Harry feels like a convincing person in it. Finally, the last pages of the book work for readers of a certain age. Steppenwolf closes not with Harry triumphing over his old self, but rather with him discovering that he is the same person he always was despite his best efforts. I suspect the young don’t much like this ending. The young believe they can be anybody they want to be (and they should believe this). Unfortunately, for those of us who have been living with our adult selves for a couple decades, the ending of Hermann Hesse’ Steppenwolf bears an unhappy resemblance to the truth.